Klein Oak sophomores Jake Braren and Kason Tullos reviewing goals with their team. 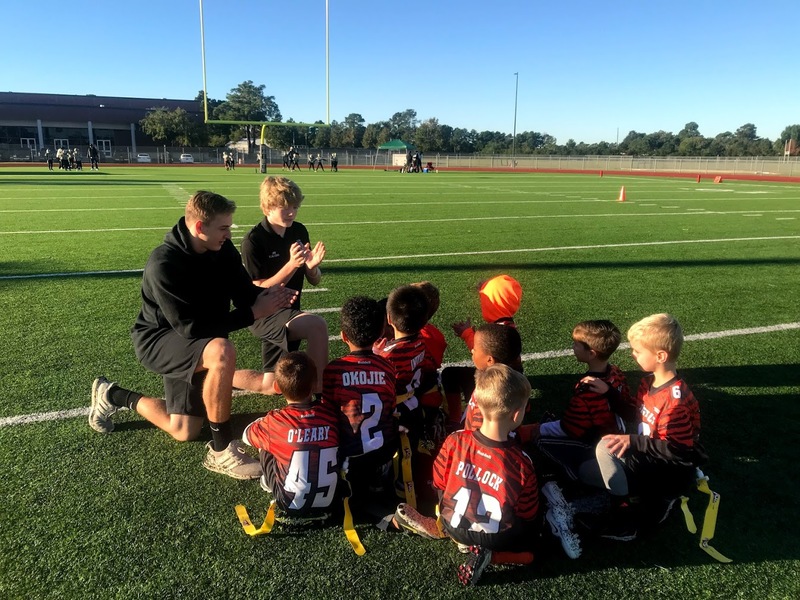 During practice, the Klein Bengals, a team of tiny 5 and 6-year-old flag football players from Benignus, Mahaffey and Mueller Elementary, could be seen warming up, running plays, and creating mischief here and there. In the midst of all this, two Klein Oak sophomores, Jake Braren and Kason Tullos, are spotted redirecting the rambunctious boys with patience and kindness. In Klein ISD, students are encouraged to become mentors to others within their communities. Braren and Tullos are perfect examples of students who fit our Profile of a Leader. Coaches Jake Braren (left) and Kason Tullos (right) posing after a game with Bengals player, Cole Ebbeler. They are both Promise2Purpose Investors, individuals inspiring, coaching, encouraging and developing others, and Relationship Driven by creating trust, partnerships and collaborations and leading with our values of integrity, gratitude, humility and kindness. 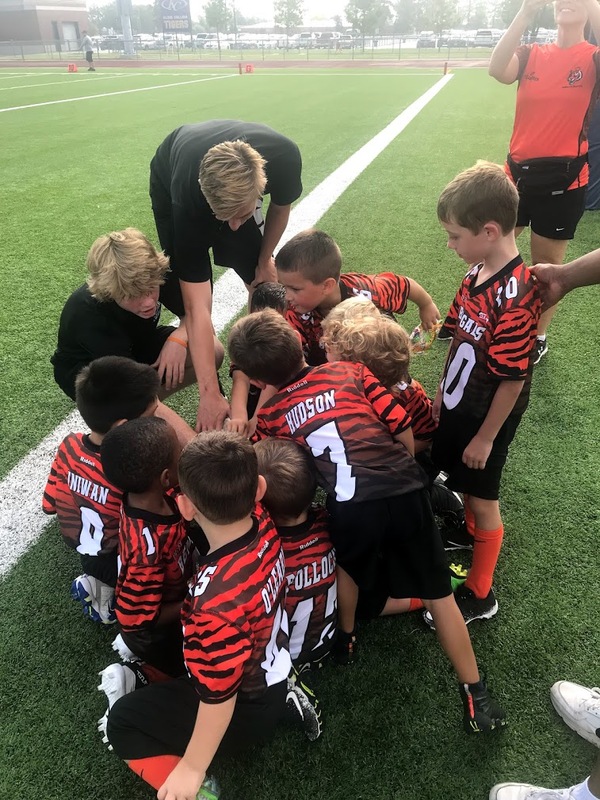 Braren and Tullos have been in the All-American Youth Football league together since they were 3 years old and were clearly excited to be coaching this team. Even parents of the players expressed how well the two coaches connected to their children and outshined other rival coaches on the field. Both boys stood up tall and were visibly proud of their team’s accomplishments and progress. The Klein Bengals huddled together. 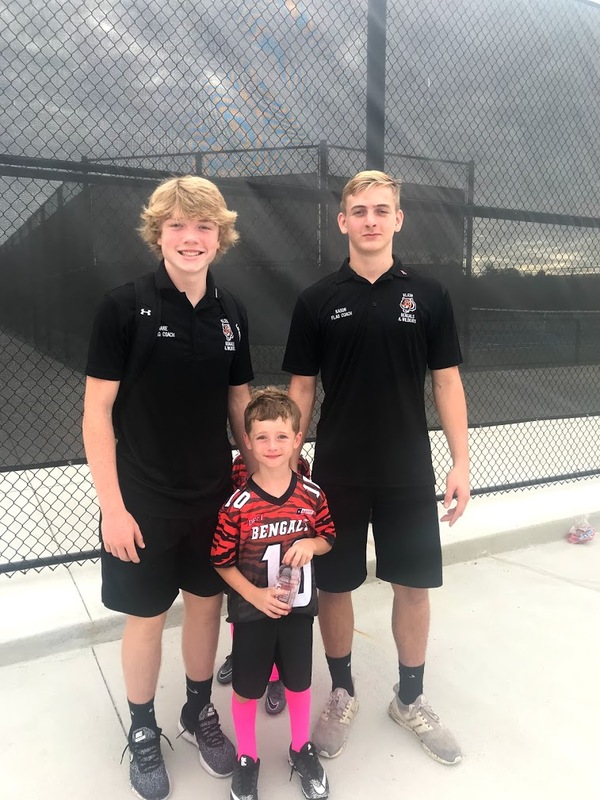 Students like Jake and Kason are role models in our community and Klein ISD is proud to have them positively impacting the lives of younger children in our schools. Updates on their journey to the Playoffs and Superbowl will be posted. Learn more about our Promise2Purpose vision at https://kleinisd.net/vision/.